Santorini is an island in the southern Aegean Sea, about 200 km (120 mi) southeast of Greece's mainland. 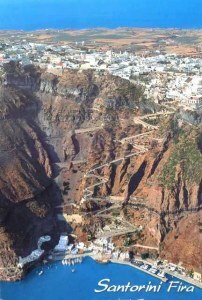 It forms the southernmost member of the Cyclades group of islands. The island is the site of one of the largest volcanic eruptions in recorded history: the Minoan eruption (sometimes called the Thera eruption), which occurred some 3,600 years ago at the height of the Minoan civilization. 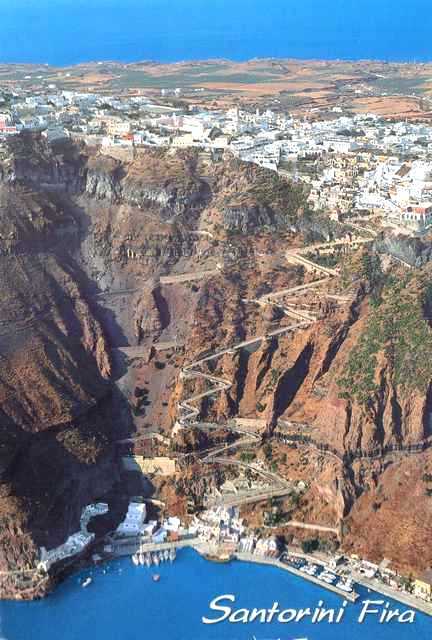 The eruption left a large caldera surrounded by volcanic ash deposits hundreds of metres deep and may have led indirectly to the collapse of the Minoan civilization on the island of Crete, 110 km (68 mi) to the south, through a gigantic tsunami. Another popular theory holds that the Thera eruption is the source of the legend of Atlantis.